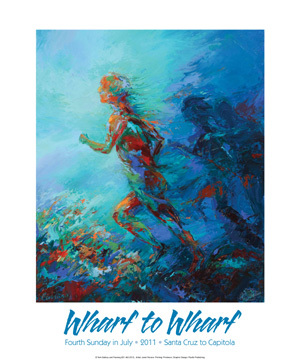 I was asked by the owner of York Gallery, who works with the Wharf To Wharf Race Committee, if I would consider creating an artwork for the Annual Wharf To Wharf Race for 2011. She liked how I captured the energy and motion of horses in my paintings and asked if I could do that with the human form. Having studied the human form in my life drawing classes, I knew that I was comfortable with the human figure and asked if we could assemble a group of runners for me to photograph. 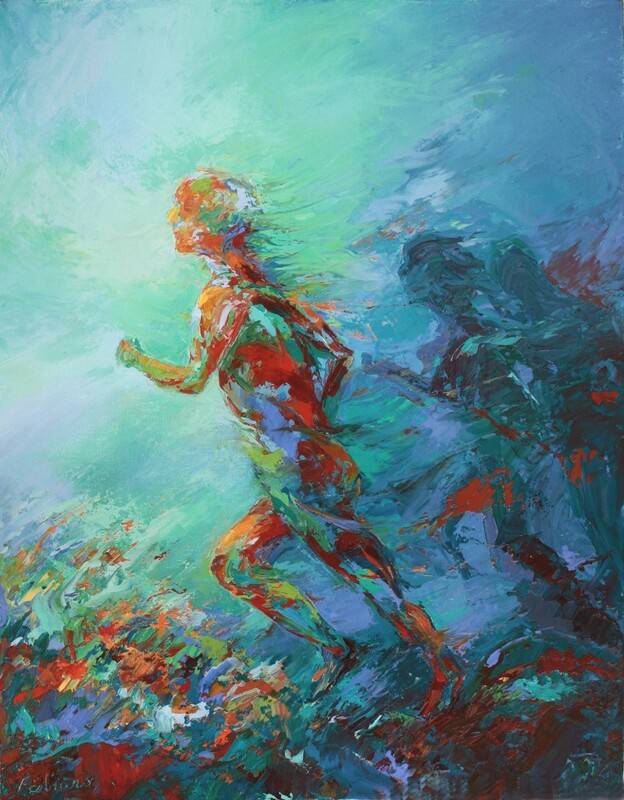 As I photographed the runners I experienced a connection to the beauty and motion of the human form and felt this as I applied oil paint with palette knives to my canvas. My painting was accepted by the Wharf to Wharf Committee and is the official 2011 Wharf to Wharf artwork for the poster. The race attracts 15,000 registered runners each year from all over the world. I am honored to have been commissioned to paint Second Wind and plan to express myself in this expressionistic, painterly manner more in the future. The poster and giclee reproductions are available through York Gallery in Santa Cruz, CA. 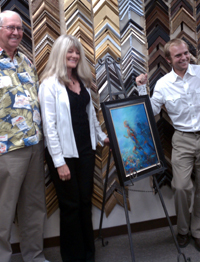 Photo: Kirby Nichol from the Wharf To Wharf Committee, Janet, and Scott, the runner who is depicted in my painting – at the York Gallery for the painting’s unveiling reception party, June 17, 2011.